if ya don't buy me what i want ima throw a fit she really went awf this time. How do you all feel about Tinashe doing Dancing with the Stars? THEY ALL WANT HER. Her leaving RCA just before Rent so she could get her name out there, a strategic queen. 2019 is about to be her year and I'm not ready. I kinda just want her to stay indie but if there's a good label on the table that'll give her control over her music and not force her down the pop route then I'm here for it. I'm so ready for Tinashe to finally receive the recognition she deserves. So many people rag on her, but she's really one of the most talented artists around today. Vocals, choreography, work ethic, style, she's got it all. Now I know the feeling of dying and going to Heaven. I'm still LIVID over RCA tanking Nashe like that but this sounds cute (it gives me filler track vibes but w/e). I really want to hear Fashion Nova in HQ tho. She's got to be dropping soon, she updated her Twitter and Insta Mozzarella Sticks BEST be on the album / mixtape, this is a bop. I'ma stay sitting until it actually happens but word on twitter is that she's dropping a mixtape at midnight. 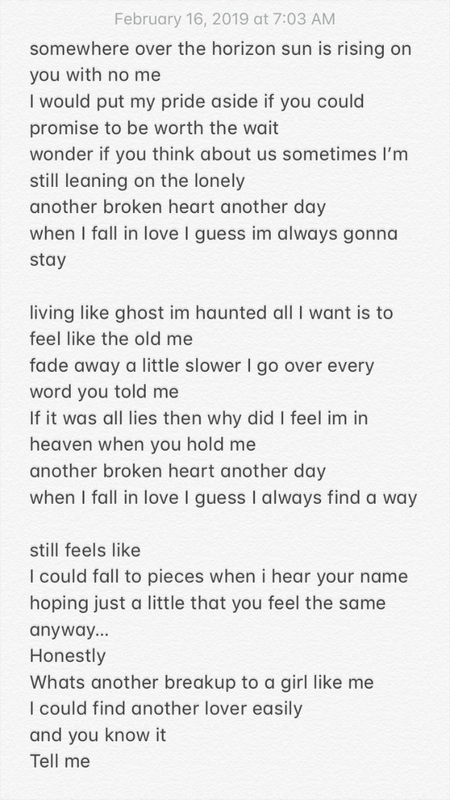 Posted on T's IG stories about 30 minutes ago. She's not a songwriter, she's a freaking poet.